At the beginning of EXP360, our Guide Kit was the first product in our portfolio. It was used for Marketing and Sales presentations in the tourism industry. Within a short time our portfolio has been extended to an amount that we could never have imagined in those early days. Compared to the current tools available and the use cases and various industries where our clients have implemented our portfolio, this was quite a small business. As much as we would like to take all the credit for developing such a wide portfolio of features and tools, this would not actually be true nor fair. Our amazing and extremely creative clients and partners have also done their share and have inspired us to go for new industries and use cases that we would never have considered ourselves. We feel honored to be surrounded by wonderful people who have joined us on the VR journey. Together, we are able to constantly improve our portfolio and implement new features at a very fast pace. This is our THANK YOU to everyone who has been with us on the ride! After just a few years in the business we can now see that VR is most effective and beneficial if it is an integrated part of an overall concept (e.g. an addition to an innovative training concept) and/or used for various use cases within a company. VR – just as any technology – is best used when it is not a standalone solution. 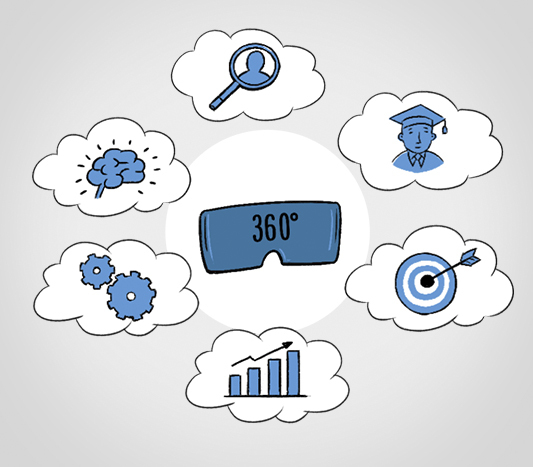 You would be surprised about the many different ways you can easily integrate VR & 360 into your organization. If you would like to read some more about our client and partner base across North America, Europe and APAC, please click here. If you want to be inspired by use cases and industries and the many ways that our portfolio is being used, please start your journey here.